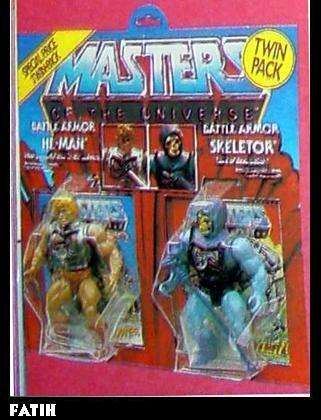 My mother got me Battle Armor He-Man as a replacement for my original He-Man after it was destroyed. 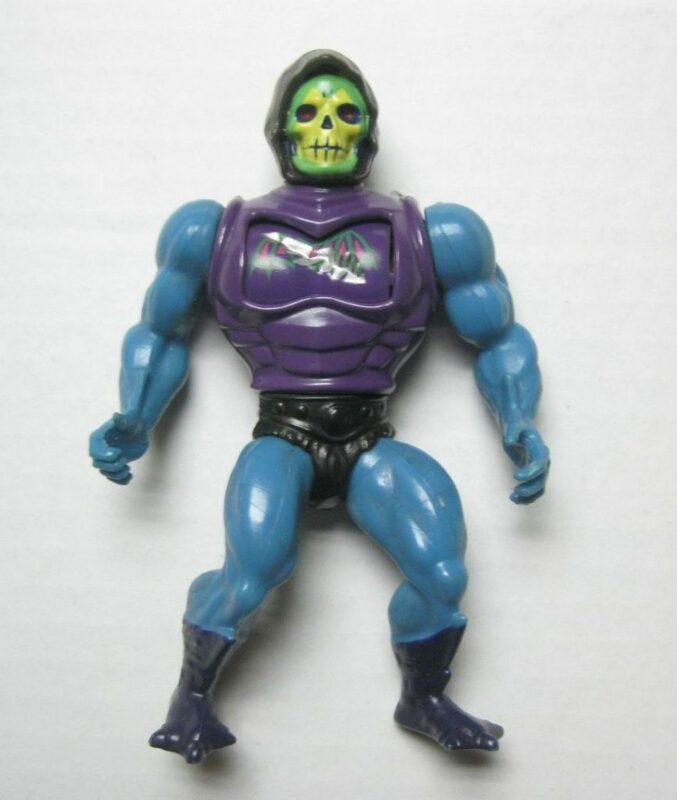 However, I still had my original Skeletor, and in that case mom logic dictated that I didn’t need Battle Armor Skeletor, since I still had the original. 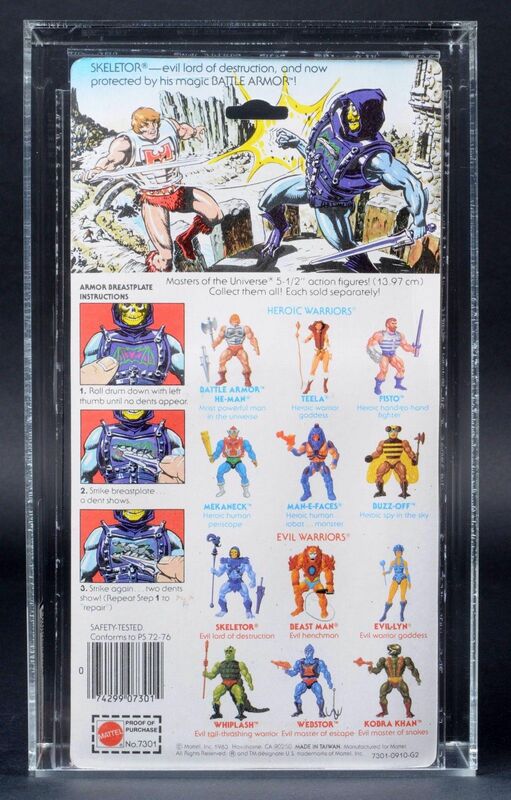 Kids and collectors understand that owning a standard action figure and owning a variant are two different experience, but I couldn’t make that case as a seven-year-old. 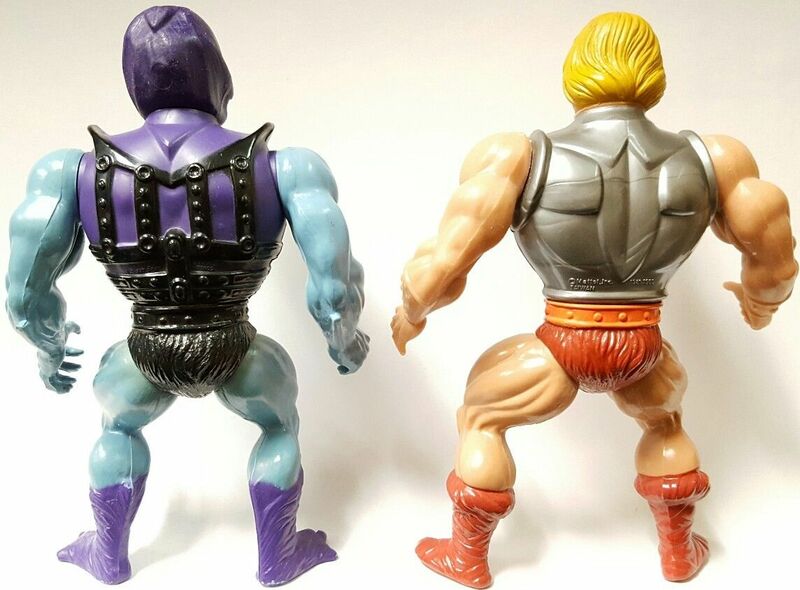 So, I had to make do with my Kellogg’s puffy sticker, and of course I played with my friends’ figures whenever I could. 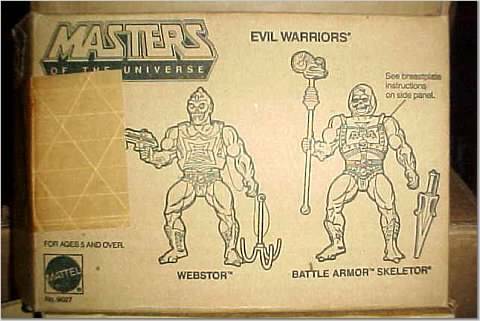 I was endlessly fascinated by both the designs and the action feature of the Battle Armor variants. 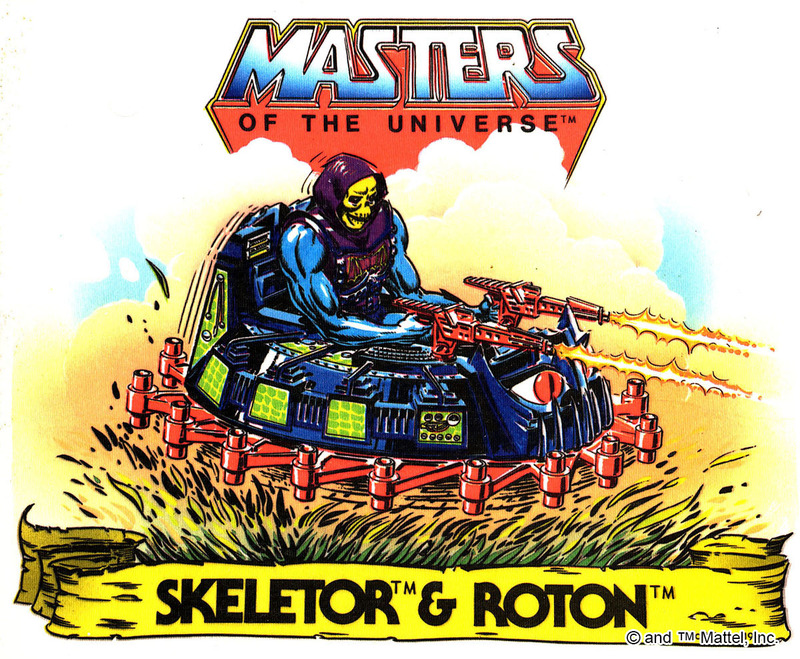 Battle Armor Skeletor reuses the arms, legs, head, crotch and weapons of the original Skeletor, but includes a spring-loaded, rotating drum in the chest that could be activated with slight pressure, exposing three versions of a bat insignia showing varying levels of damage. 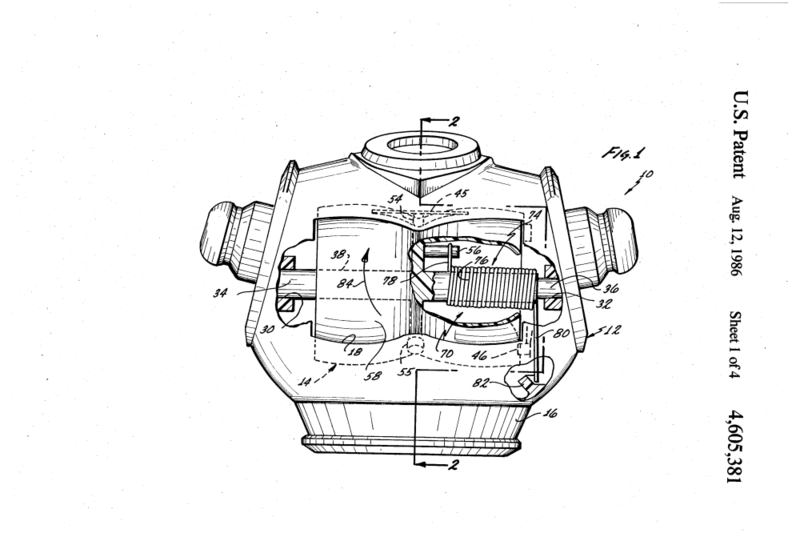 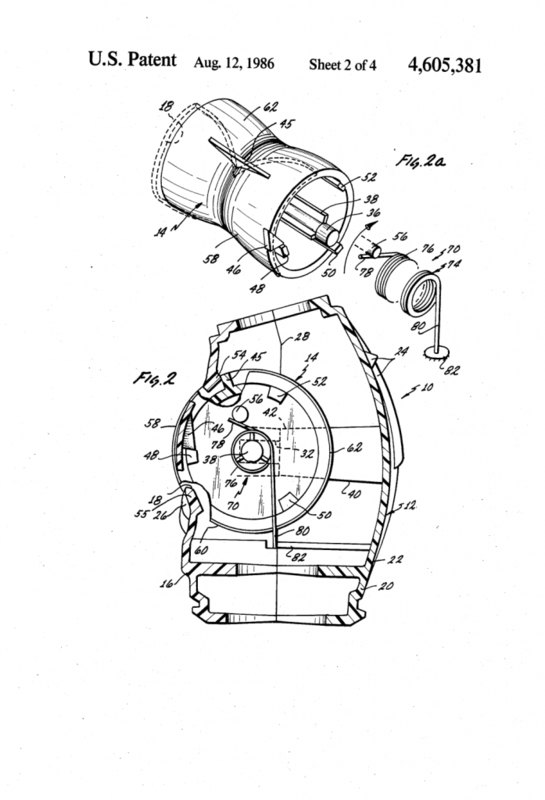 The action feature was invented by Ronald H. MacBain and Tony Rhodes, and the patent was filed December 29, 1983. 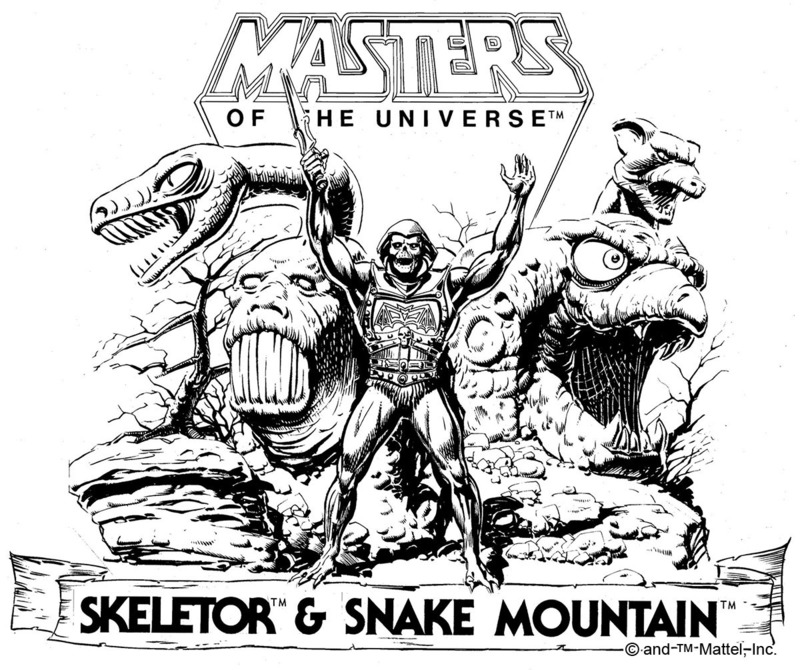 Martin Arriola also worked on the figure, which was trademarked on January 27, 1984. 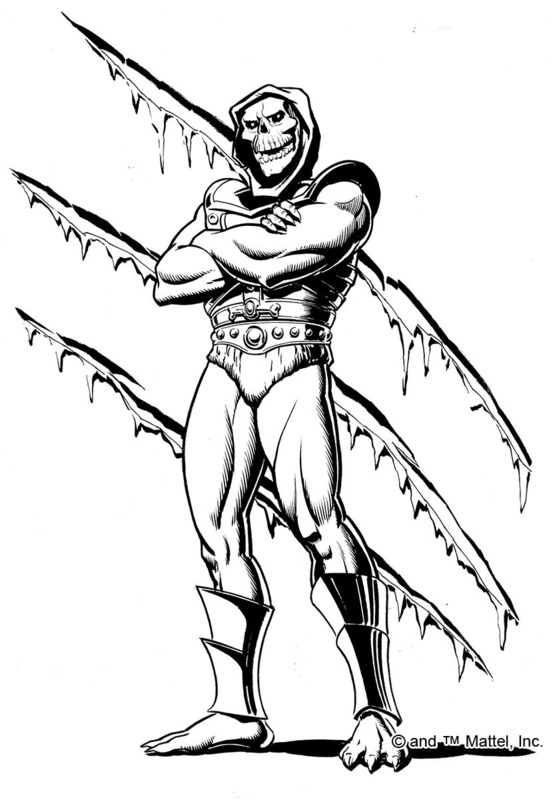 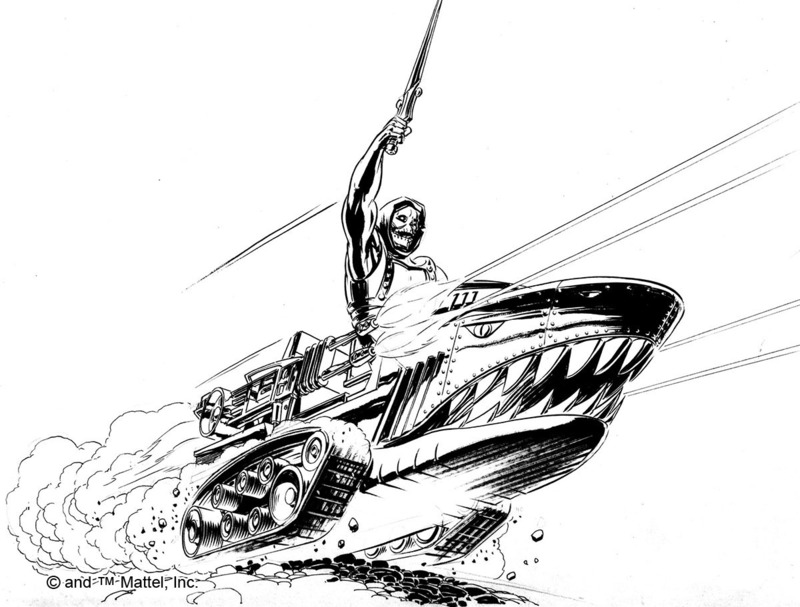 The original version of Skeletor was designed by Mark Taylor. 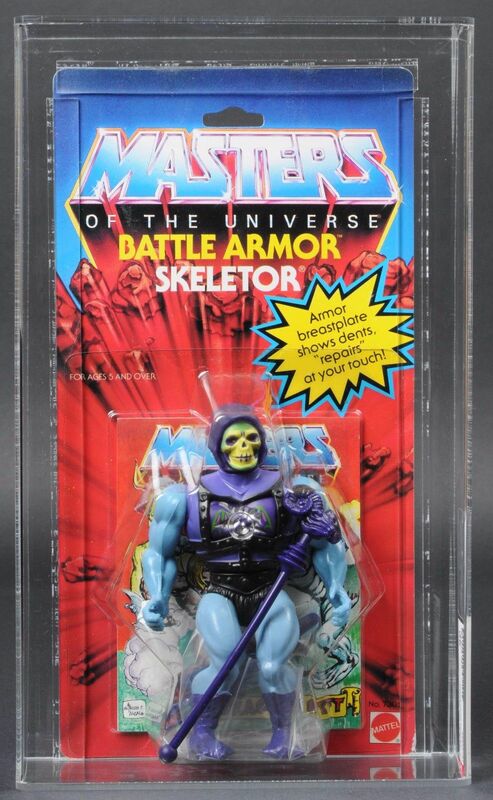 Battle Armor Skeletor cross sell artwork. 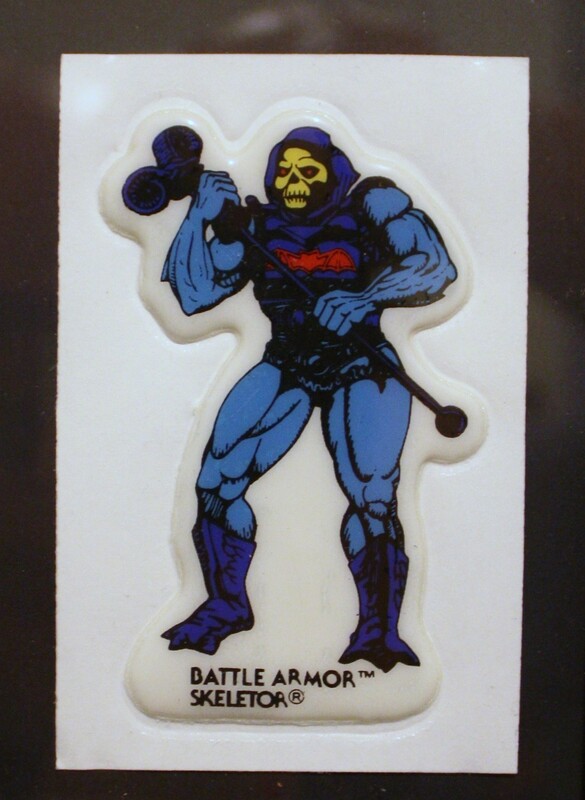 The front of Battle Armor Skeletor’s card has a burst describing the function of the action feature. 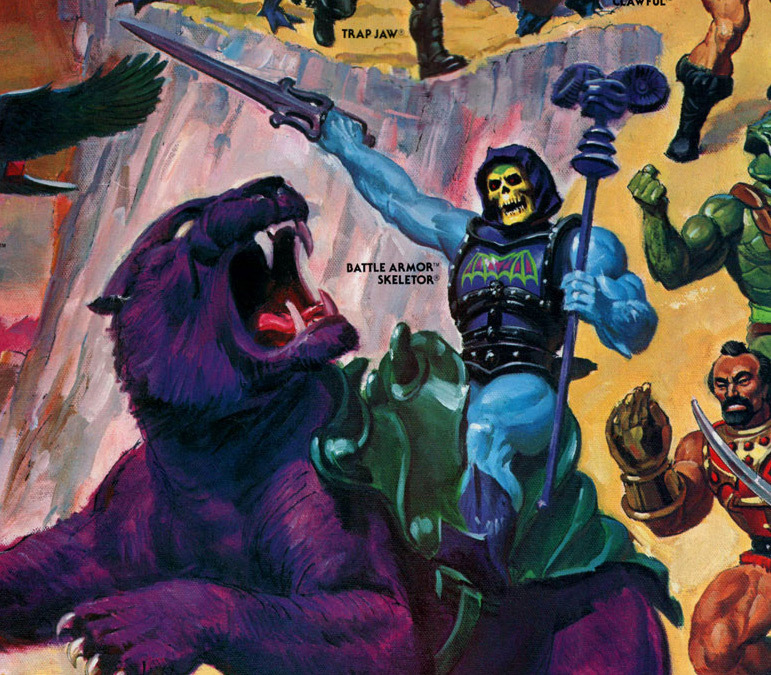 Unlike most figures released in the toy line, there is no tag line underneath his name, although he is tagged with “Evil lord of destruction” when he appears in cross sell artwork. 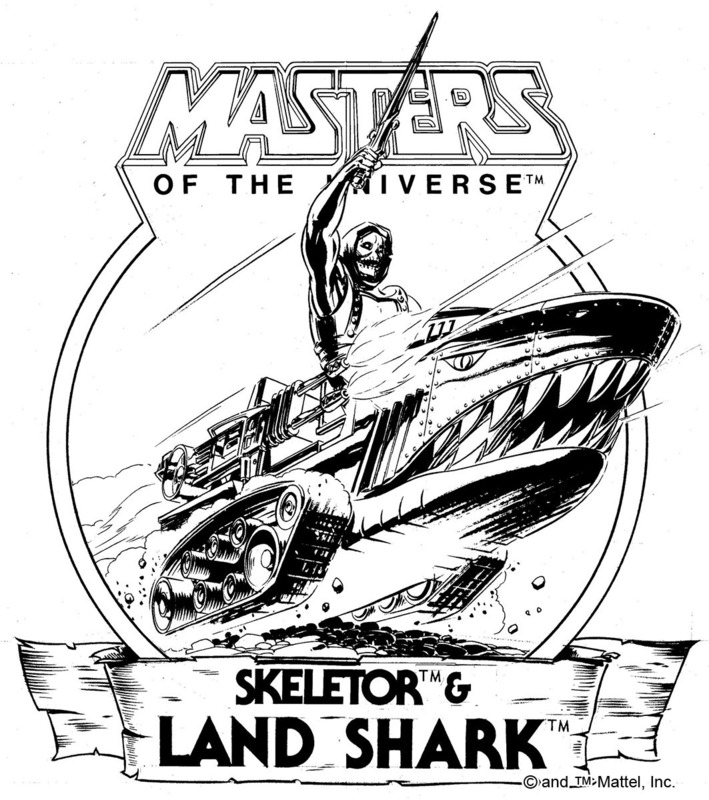 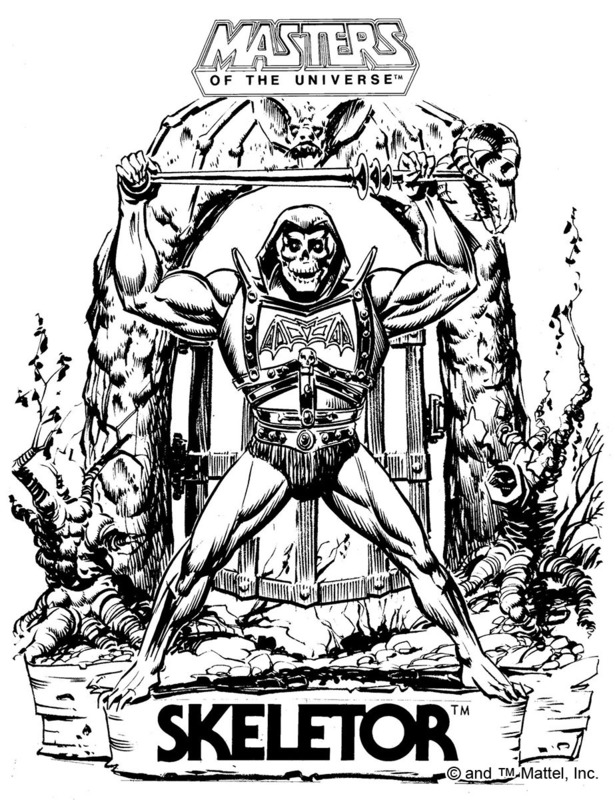 Incidentally, when Skeletor was first released in 1982, his tag line was “Lord of destruction.” “Evil” was added to the front of it starting in 1983. 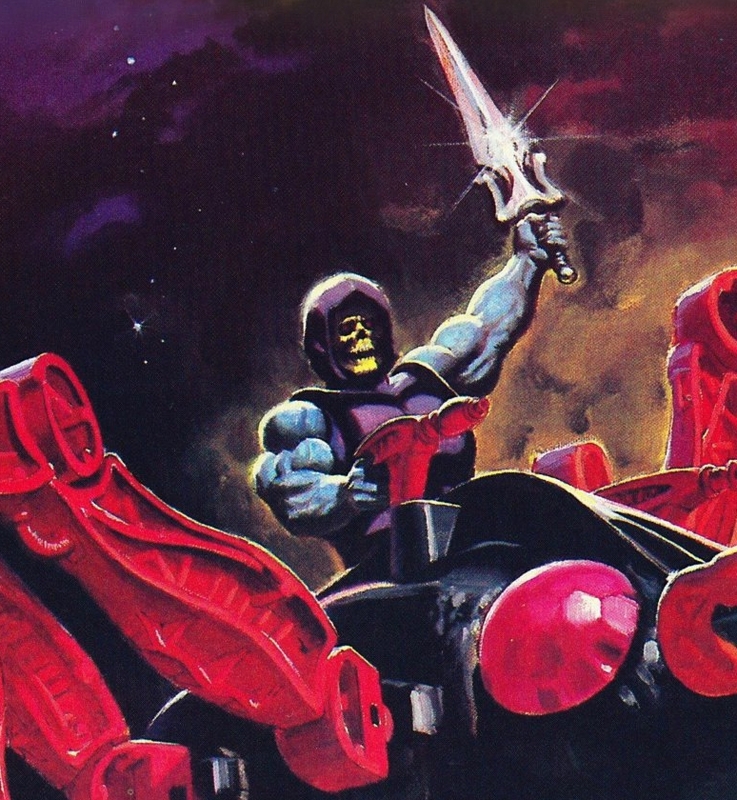 Once the student of Hordak on his home planet of Etheria, Skeletor trapped his mentor on Etheria and escaped through a dimension gate to Eternia. 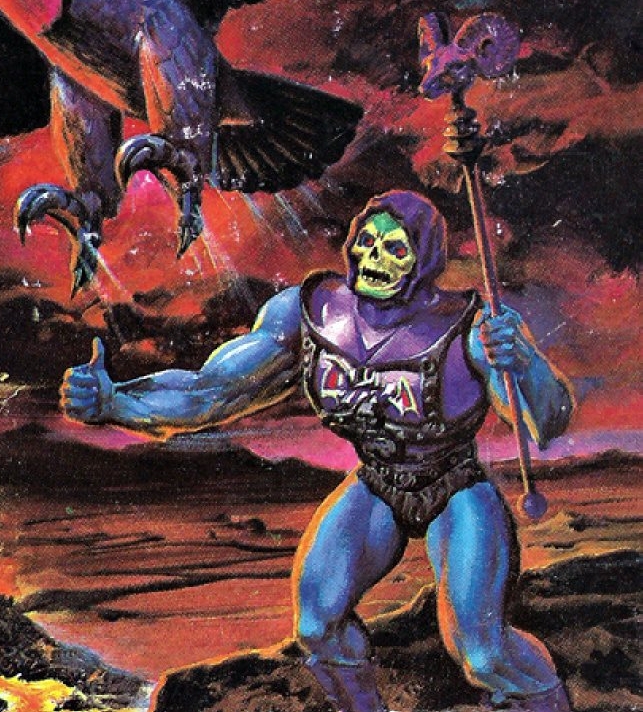 Now Skeletor embodies all that is evil in Eternia. 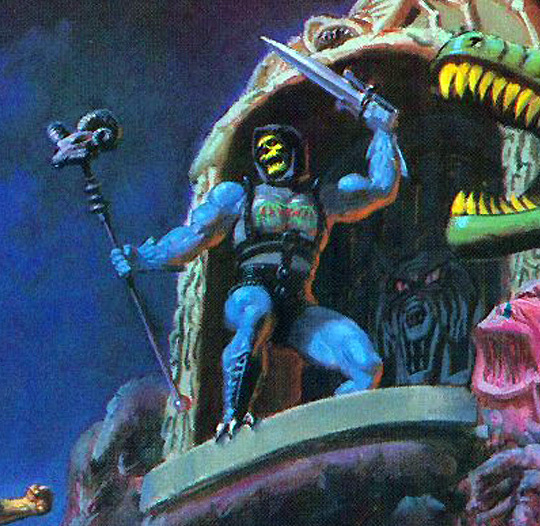 His goal is to one day rule all of Eternia, bringing upon its citizens an unending reign of terror. 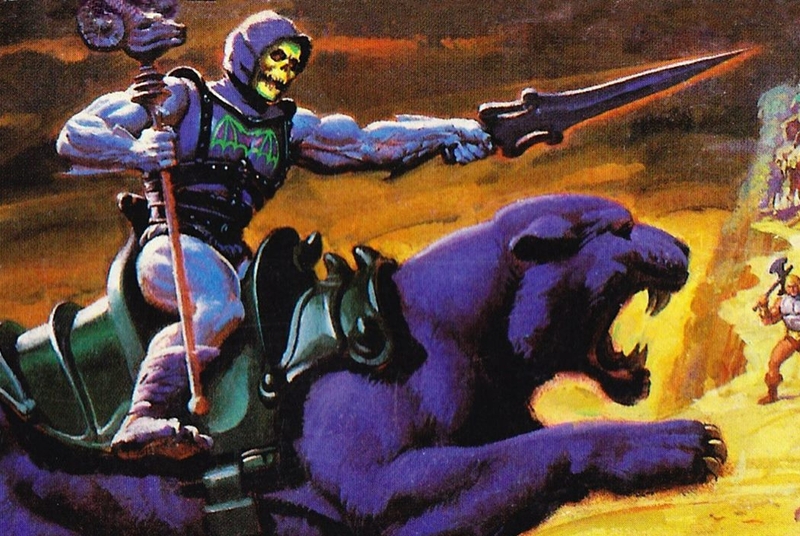 For dozens of years, Skeletor waited, polishing his magical skills in anticipation of the day when he would break through the Mystical Wall that separated the good and evil areas of Eternia. 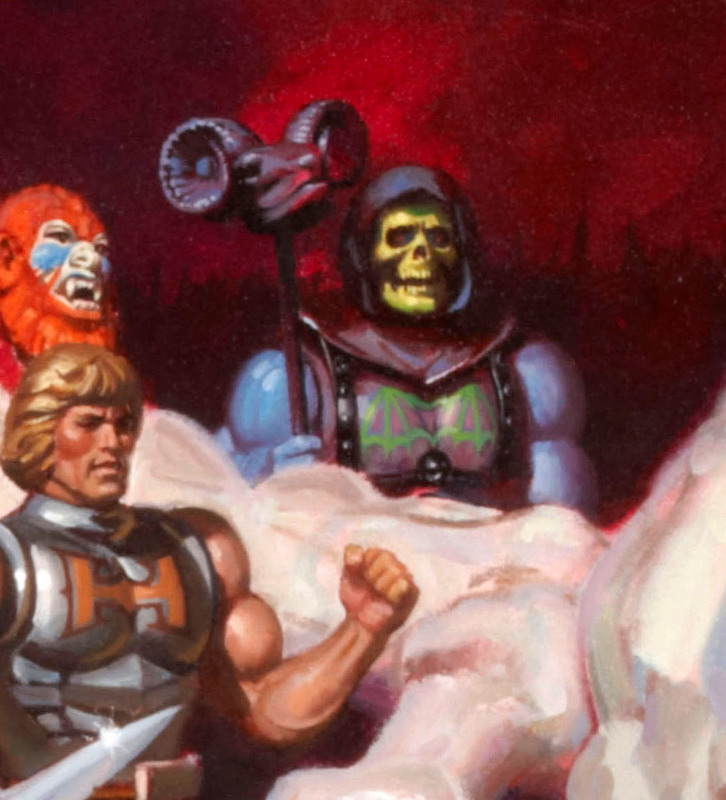 On the 18th birthday of Prince Adam, Skeletor finally prevailed. 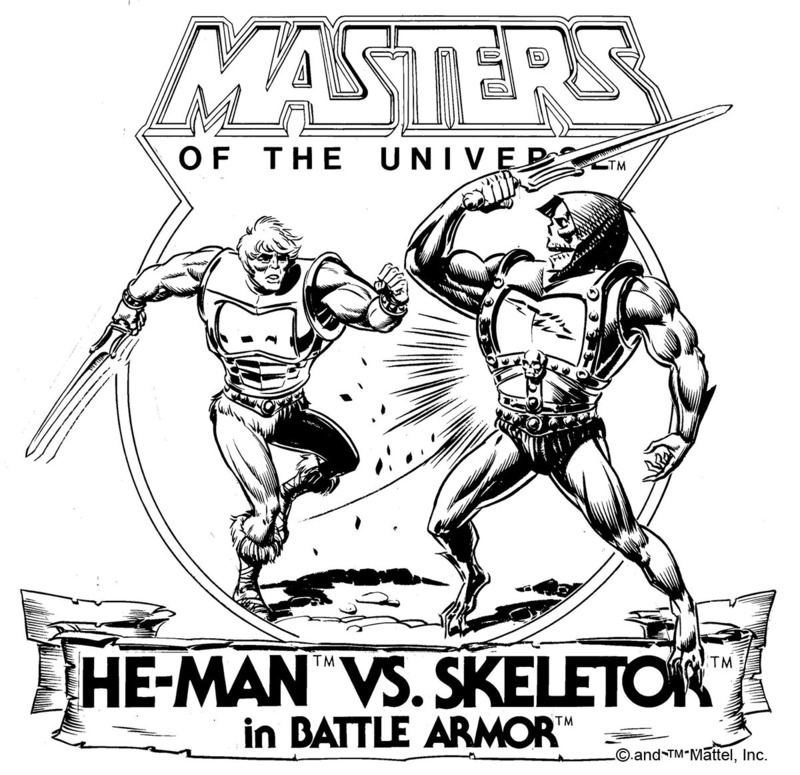 It was on this fateful day that Prince Adam first transformed himself into He-man, thus saving Eternia from the evil advance of Skeletor. 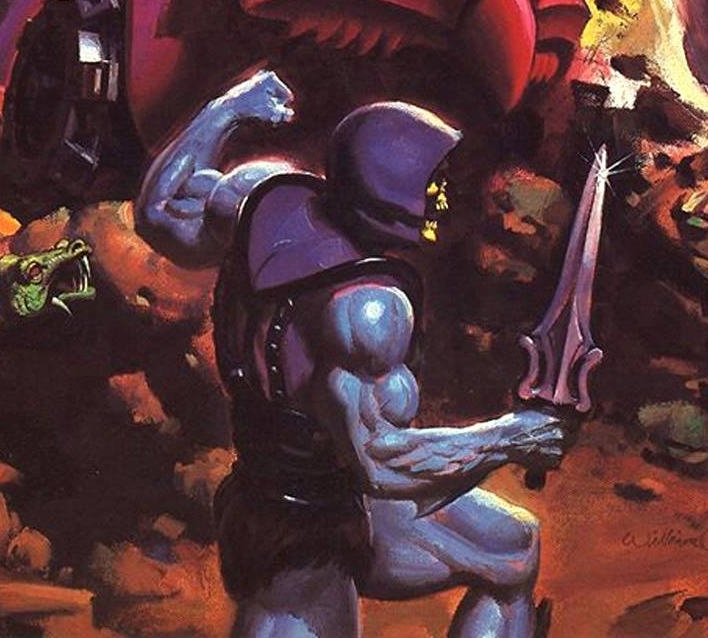 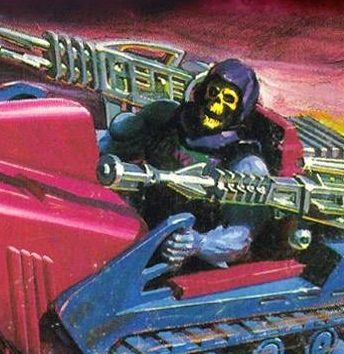 Skeletor is now committed to destroying He-Man and his allies. 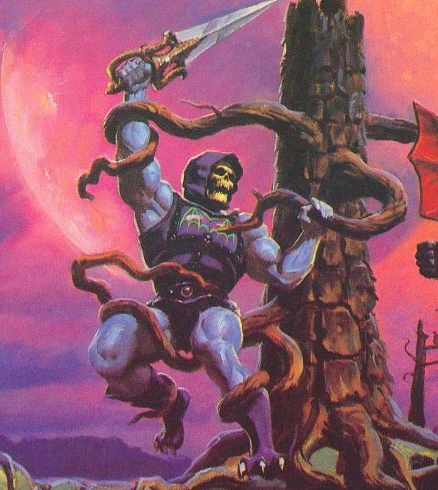 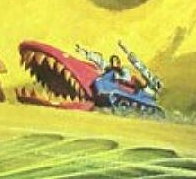 Weapons: Skeletor stalks the land with his evil pet, freezing foes with the dragon’s vicious paralyzing venom. 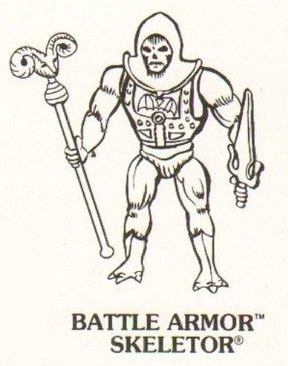 His Battle Armor gives him the power to withstand the mightiest blows of battle. 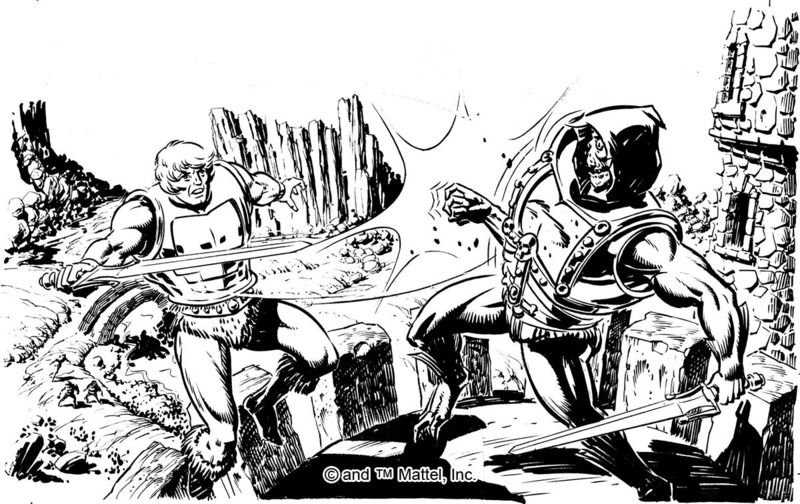 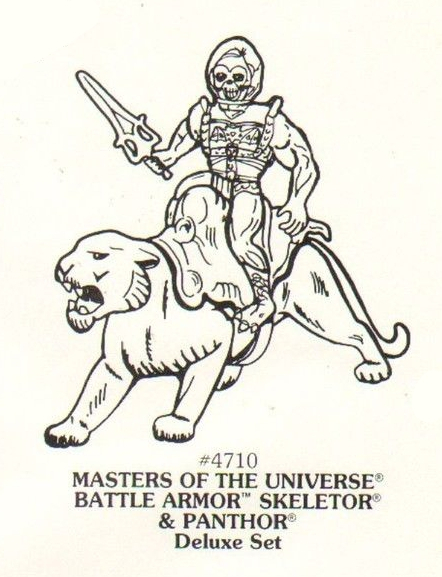 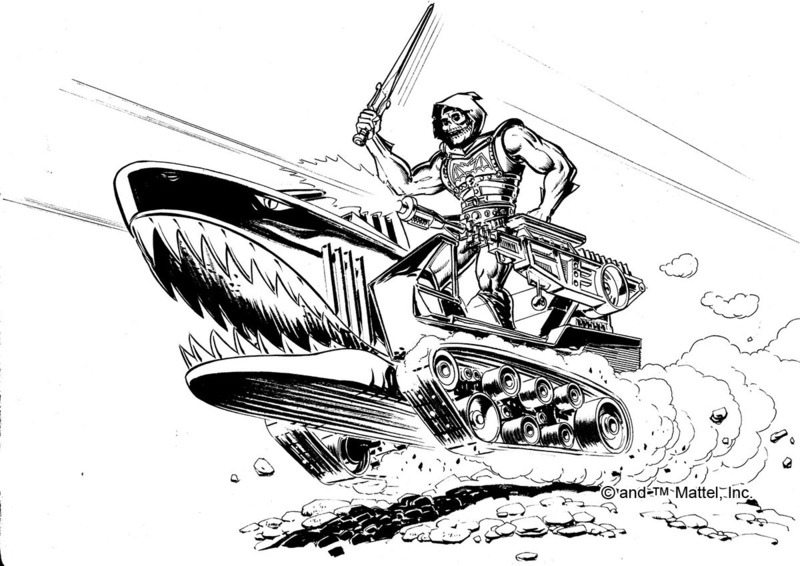 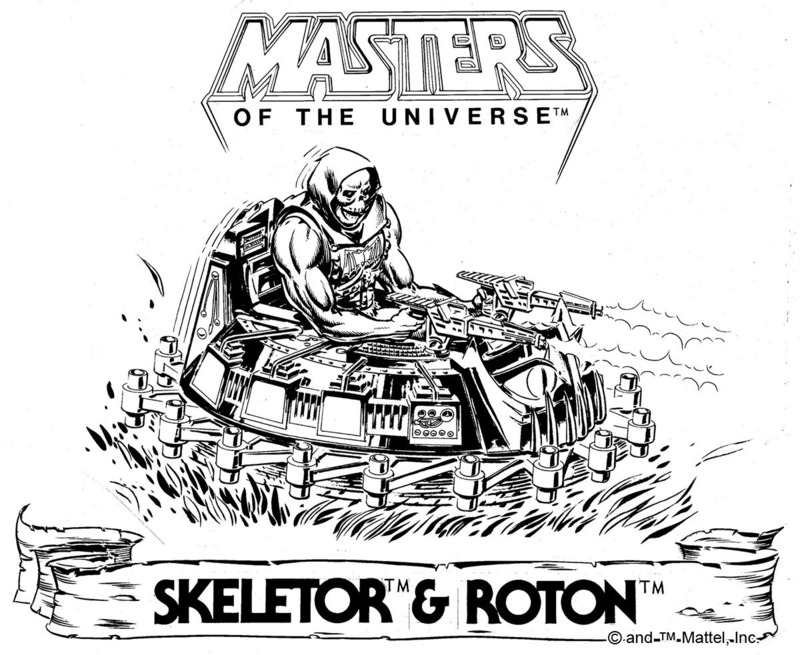 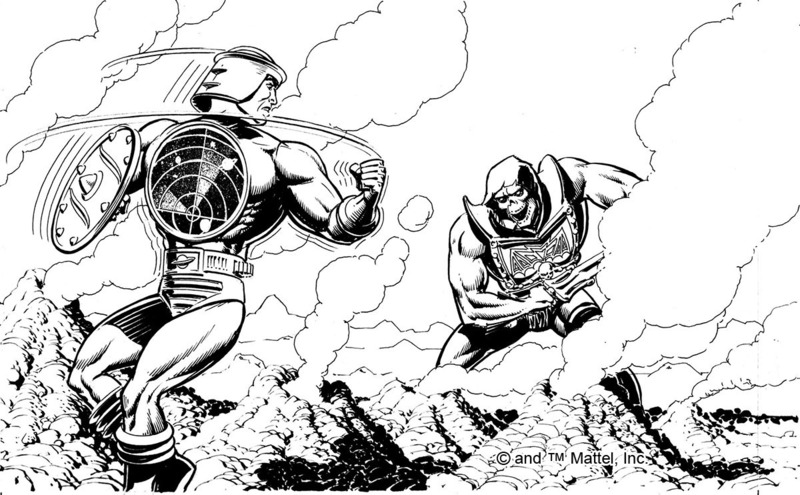 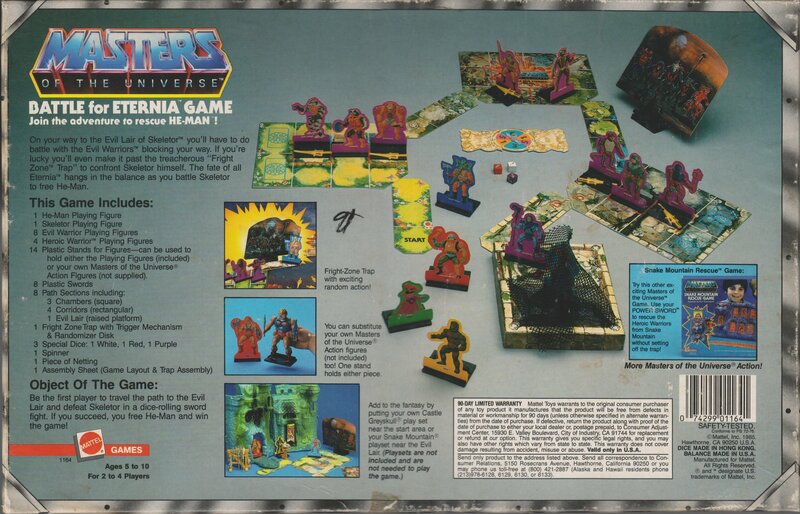 The same artist also illustrated both Battle Armor Skeletor and Battle Armor He-Man for the 1985 board game, Battle For Eternia (thanks to Øyvind for the reminder). 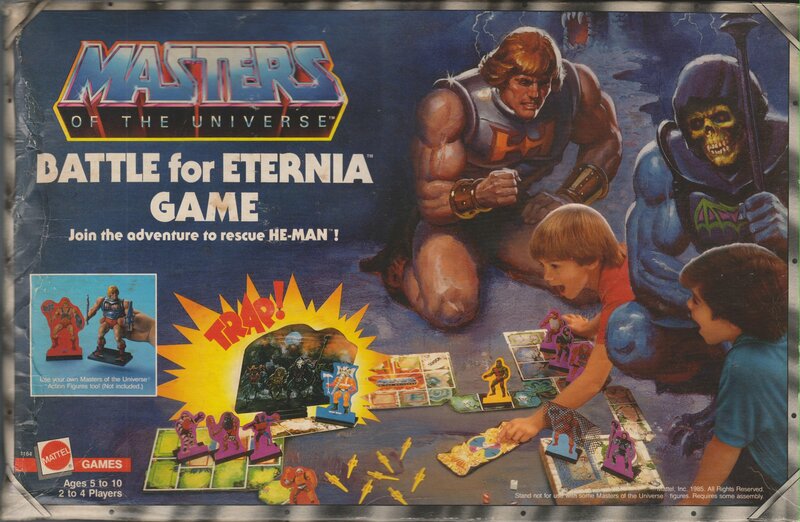 The illustration on the front depicts Skeletor and He-Man taking part in the board game with a couple of children, which is strikes me as a stroke of genius. 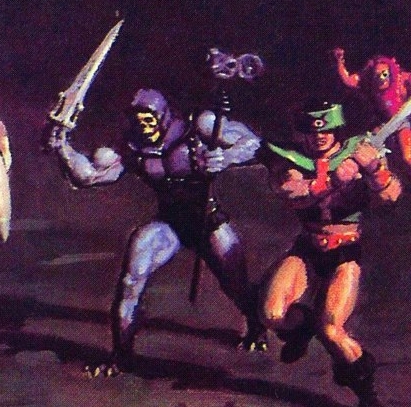 I think a lot of us imagined what it might be like to interact with these characters in real life. 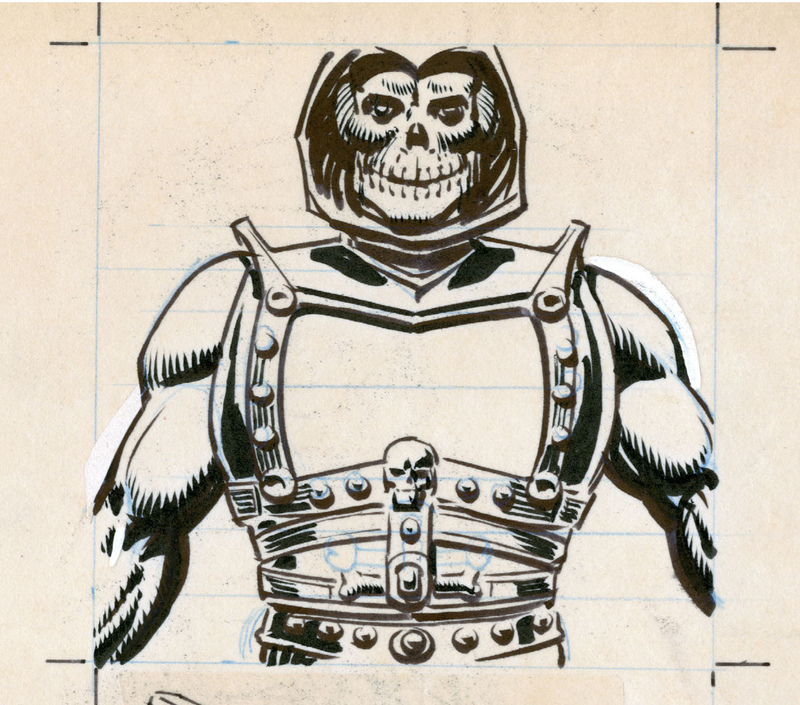 I must say the backart is a bit odd.. not bad but skeletor’s eyes… nothing like Errol McCarthy’s normal style for them.. 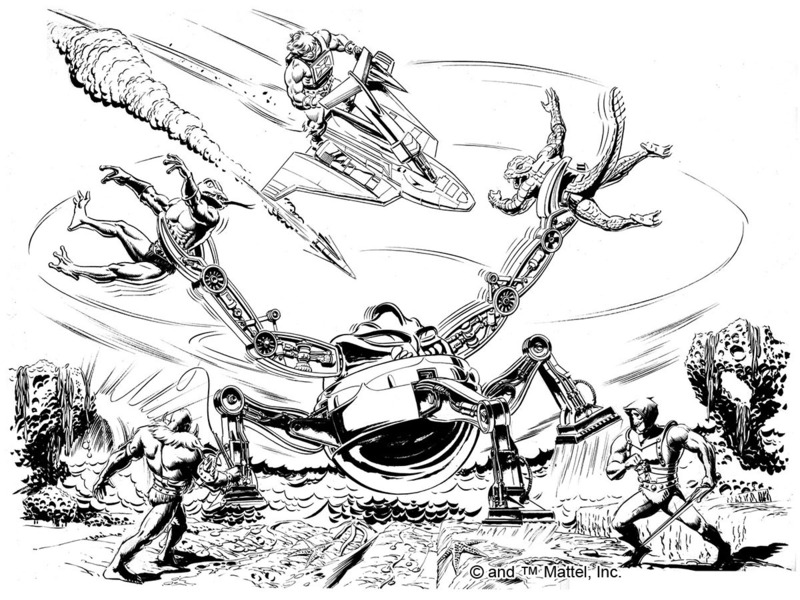 I can’t remember.. did McCarthy Ink his own work? 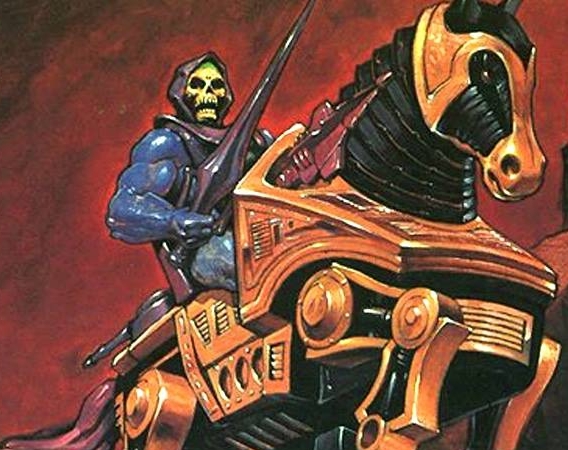 Thank you ince again for digfing in the memories !!!! 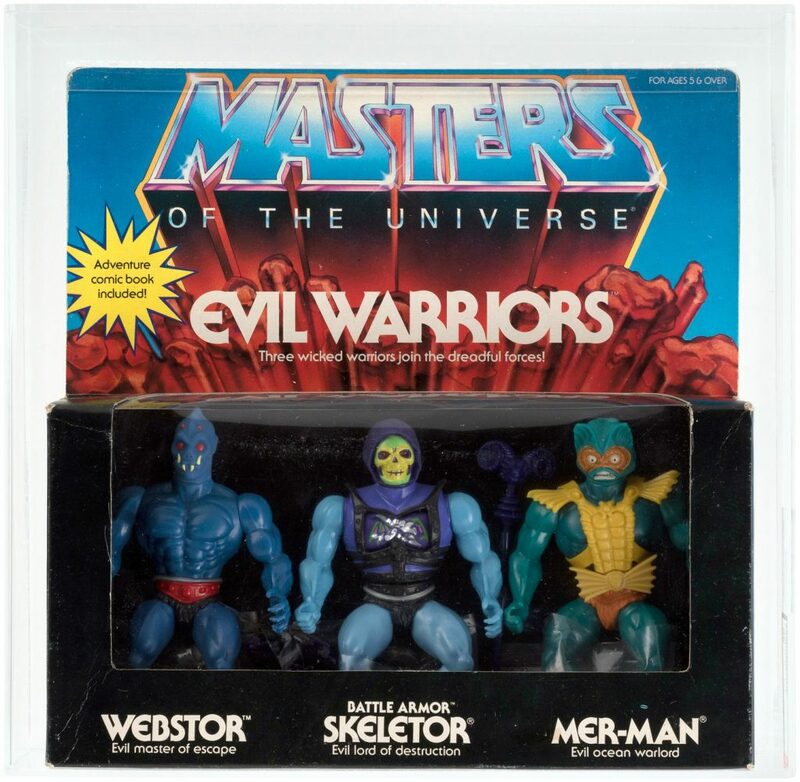 These were my first He-Man and Skeletor, as I recall. 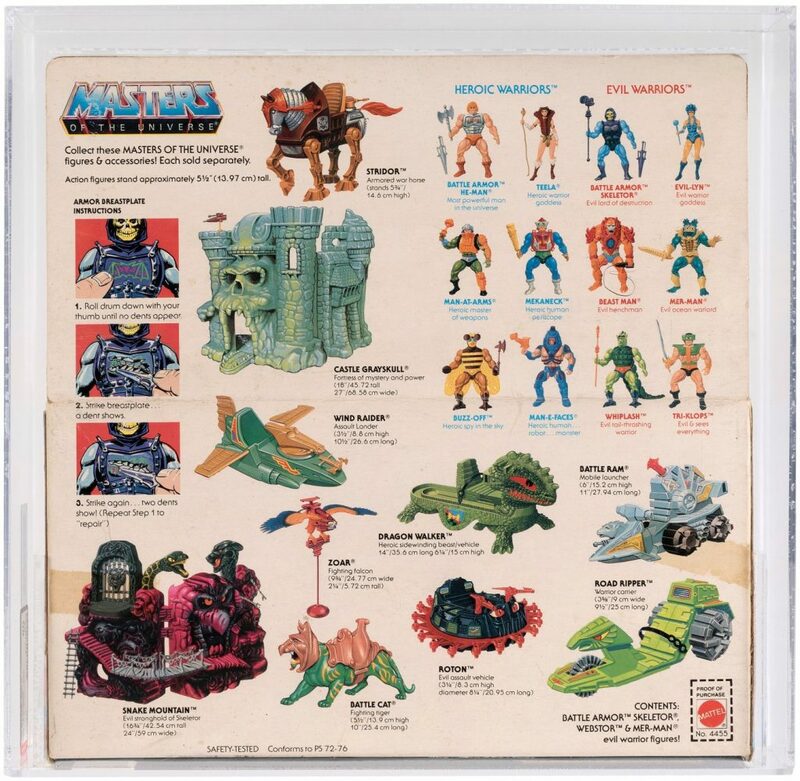 Fortunately, my parents were cool with variants at the time… sadly, they were less so with Transformers (even Hot Rod and Rodimus Prime were too close for them to budge on the former!). The gimmick was neat, but I found it too easy to knock loose, so they usually sat in “double damage” mode. 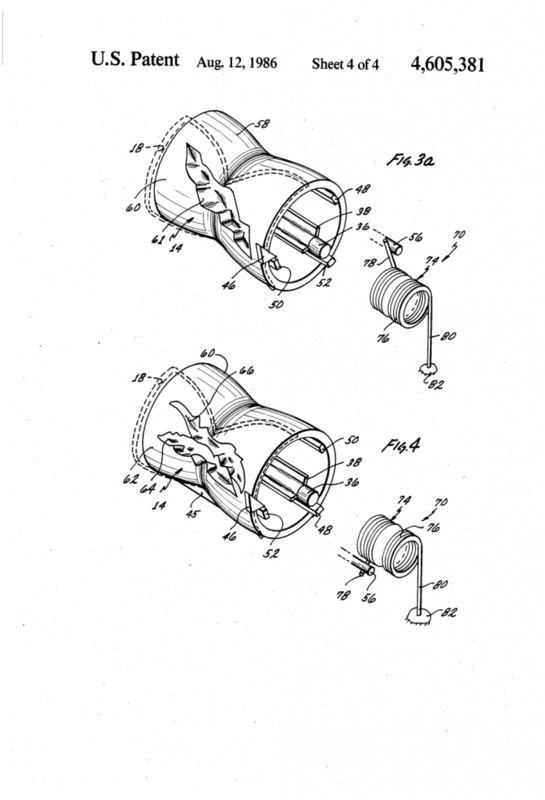 You are right: neat but quirky. 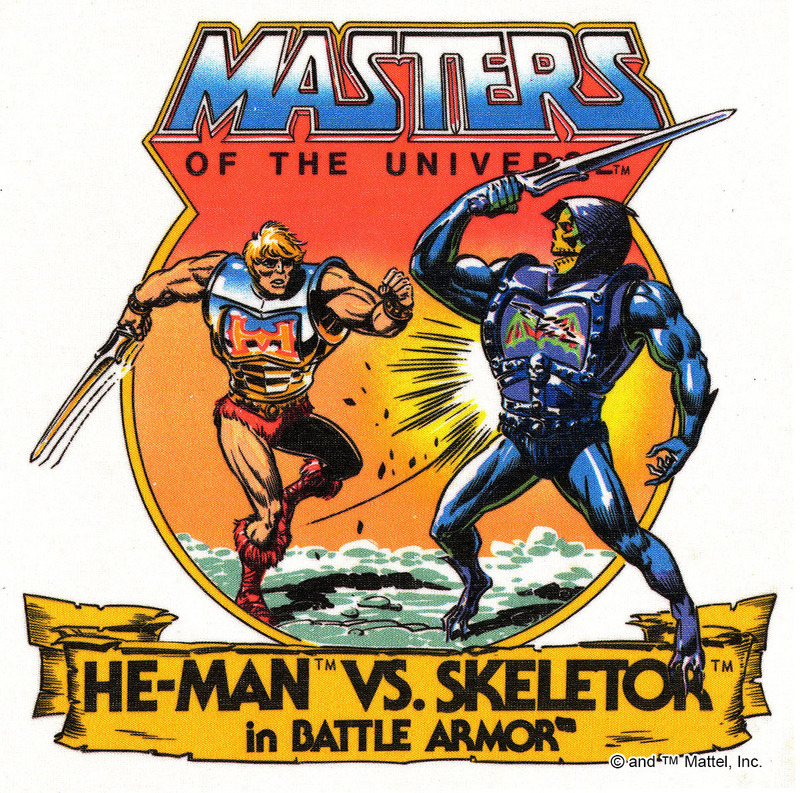 At least in my copy of BA Skeletor more often than not the chest switches direclty in “double damage, skipping the “one damage”. 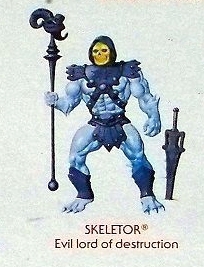 Although I never had any of the variants (other than Flying Fists He-Man, who I got very late on, mostly as a replacement for my by-then battered original He-Man), I actually did come tantalisingly close to owning BA Skeletor. 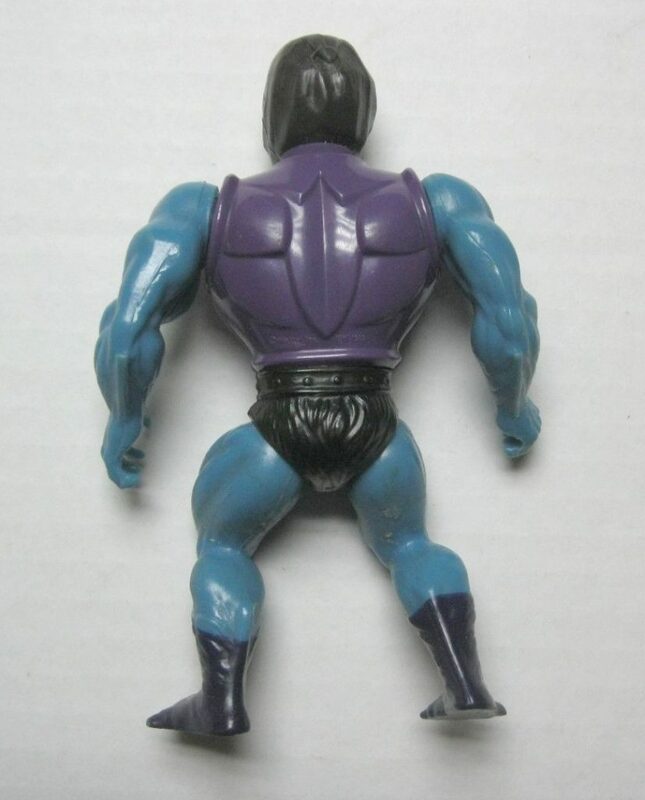 Whilst visiting relations once, my aunt gave me a figure as a present. 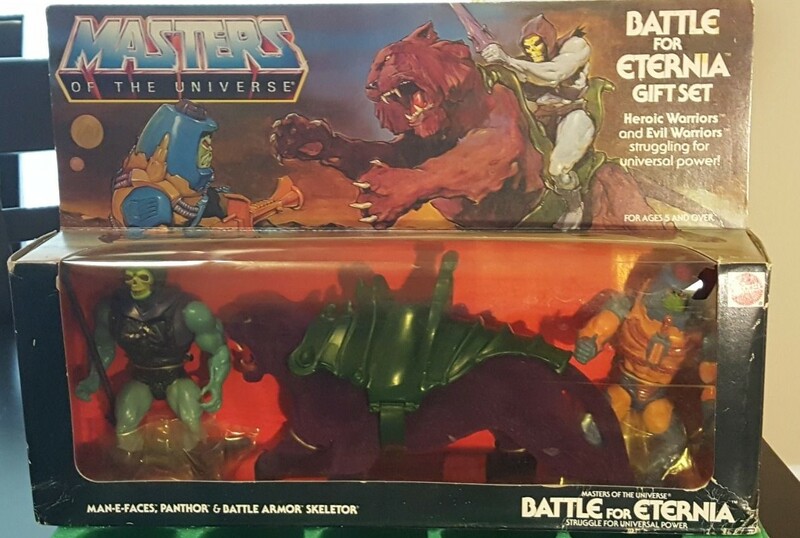 She knew I liked MOTU but beyond that didn’t know which was which and what I had, so had “picked one she hadn’t seen before”. 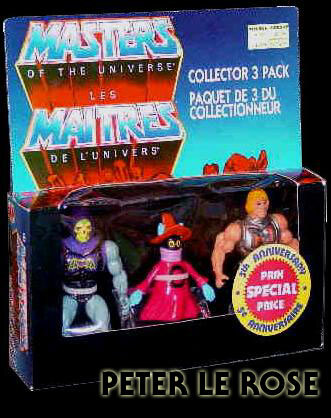 It was Tri-Klops, which I did indeed already have (one of my favourites). 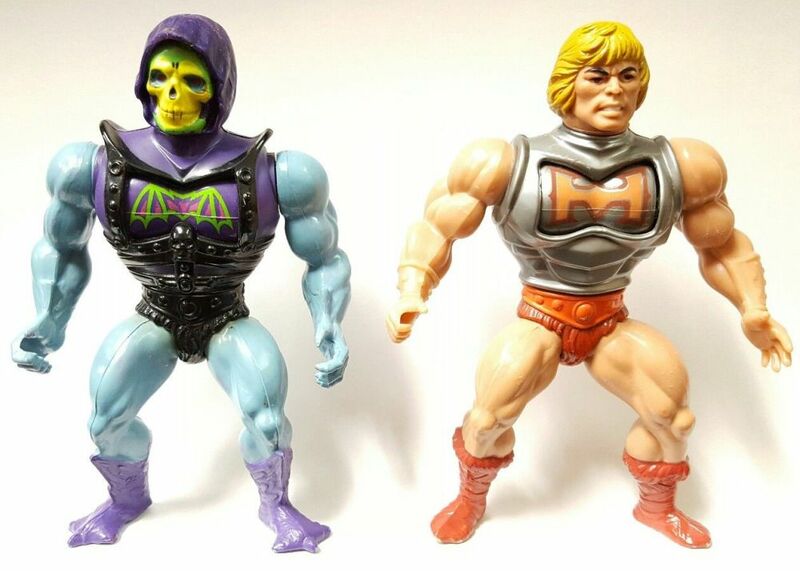 We didn’t have the receipt, so a few days later in our local town my grandmother took me into a toyshop to pick out another figure and ask in hope they’d let us swap it. 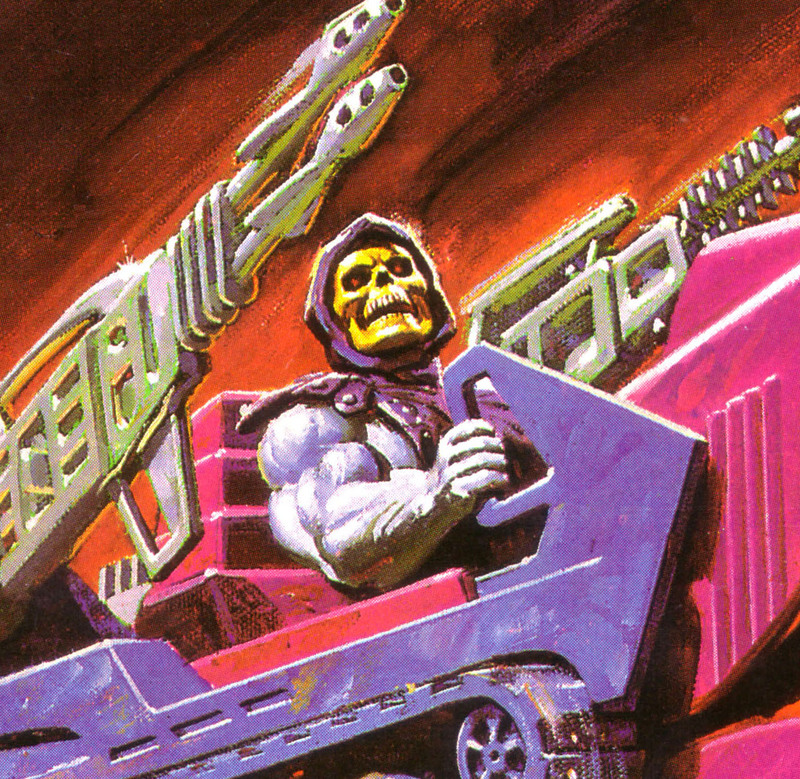 I picked out… Battle Armor Skeletor. 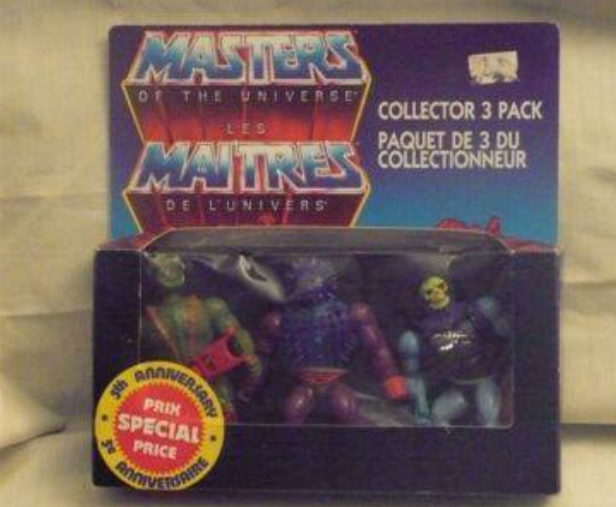 He was in my hands, holding him in my hands as we went to the checkout to explain and ask if we could swap. 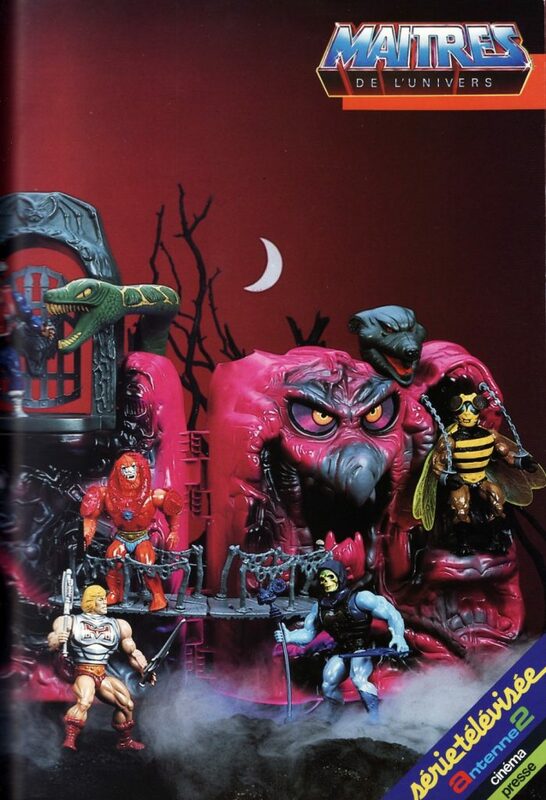 After much “I’ll check with the manager”-ing… we were told no. 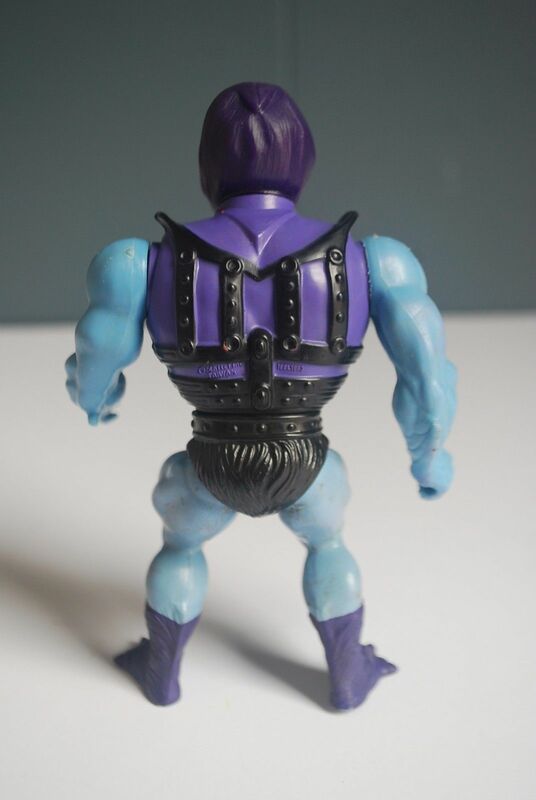 I had to put him back! 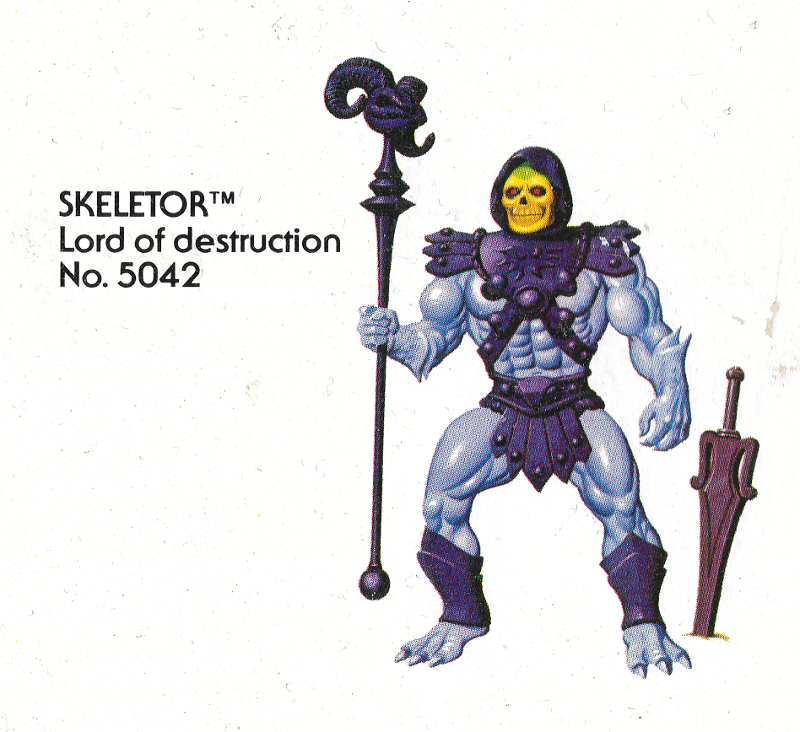 We went along to another nearby toyshop, where I hoped to pick out BA Skeletor again, but they didn’t have him. 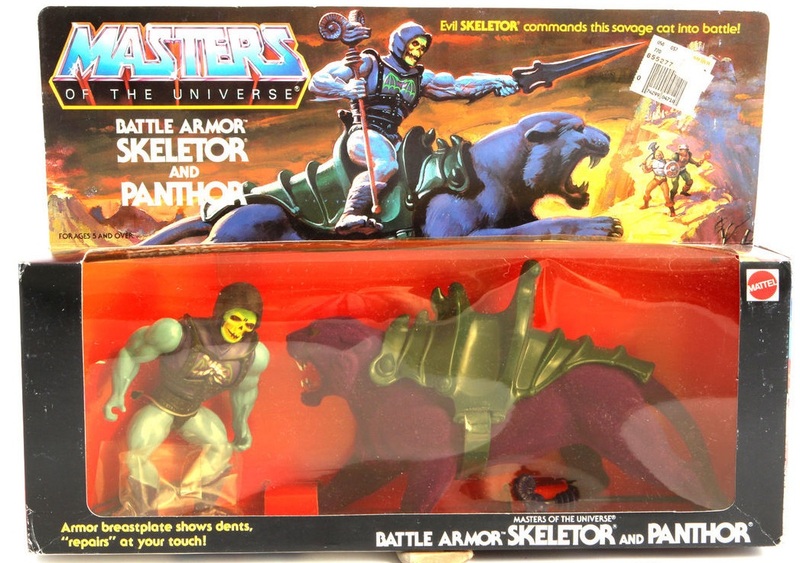 I settled on Sy-Klone (newly released and the first time I’d ever seen him)… and never did get ol’ Battle Armor Skeletor for my collection! 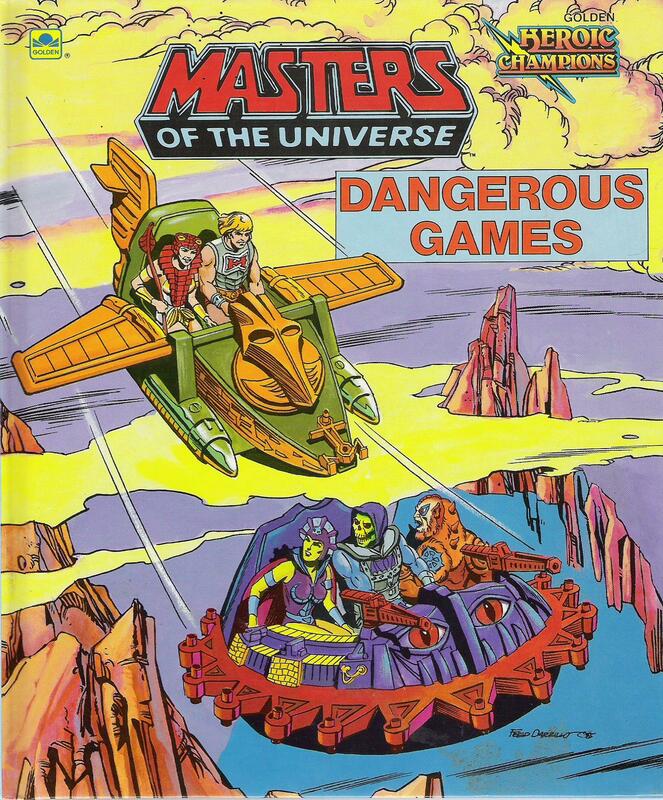 (Not till many years later where I collected the line second-hand). 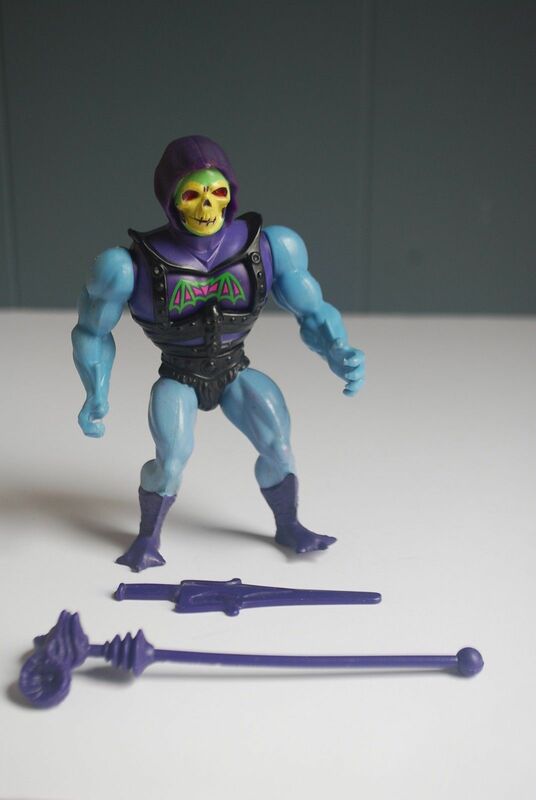 When putting together that complete set of the line many years later, I acquired numerous BA Skeletor’s, though I found nowhere near as many variants as with BA He-Man, save for the “some with original hollow head, others with the mid-line “solid rubber but not hard plastic” head. 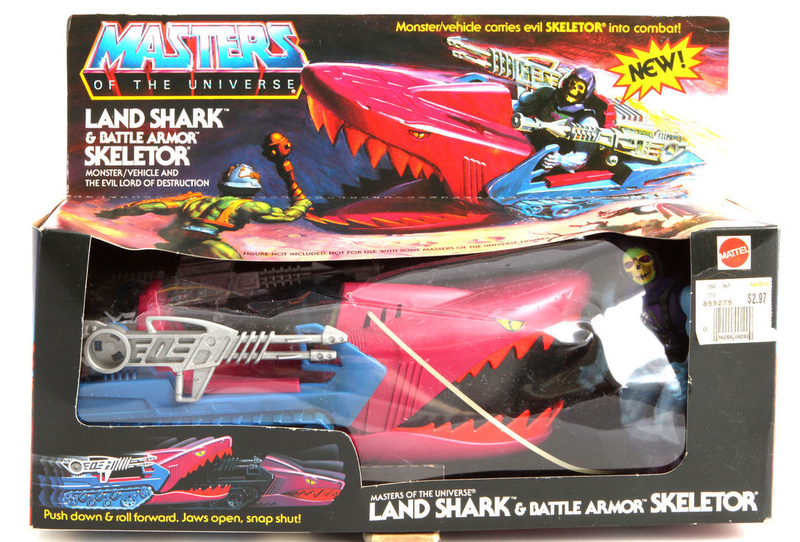 This was probably the most used toy from my childhood. 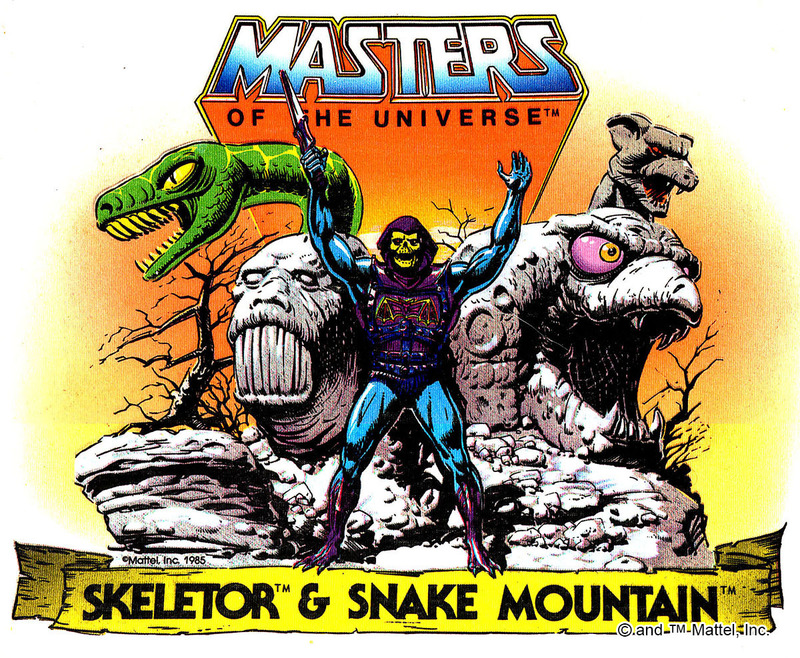 Skeletor is cool in a way to me that he could be bigger or smaller than the other characters, to a degree, depending on situation. 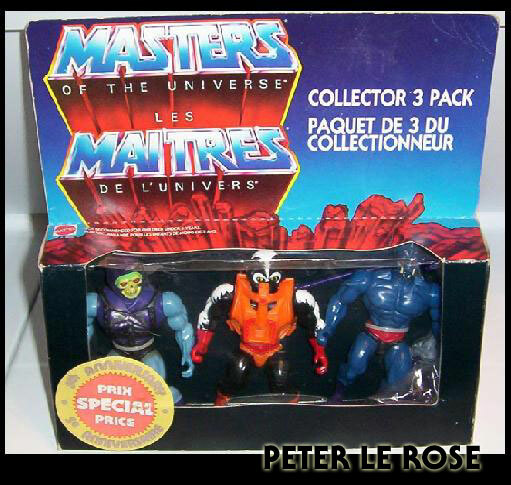 With all the magic and the muscles, I could see him somewhat towering over my TMNT toys, a little smaller than my Transformers, etc. 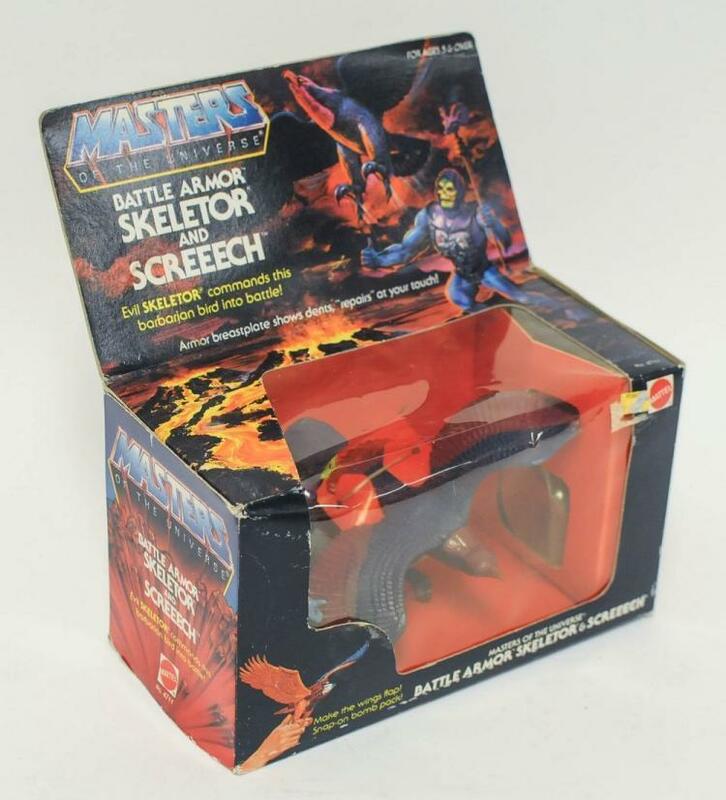 This toy just made my imagination go wild, Skeletor was already an amazing design but you add that Battle Damage, and it was just ten times better. 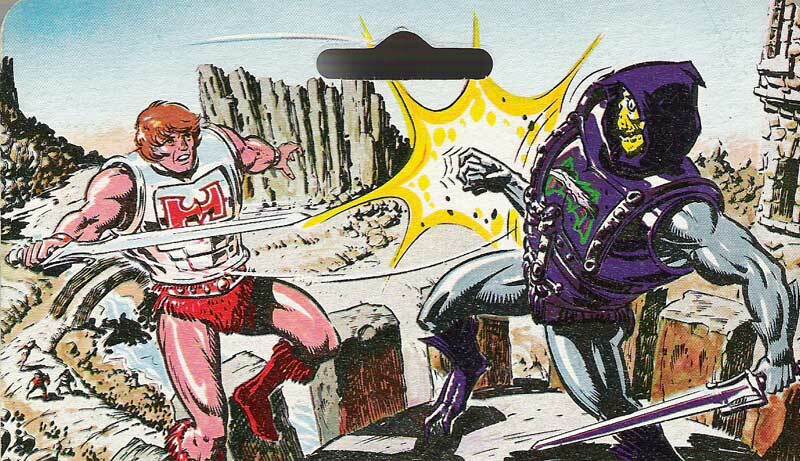 I think I played it basically that he’d go until two swipes of damage before he’d cowardly retreat. 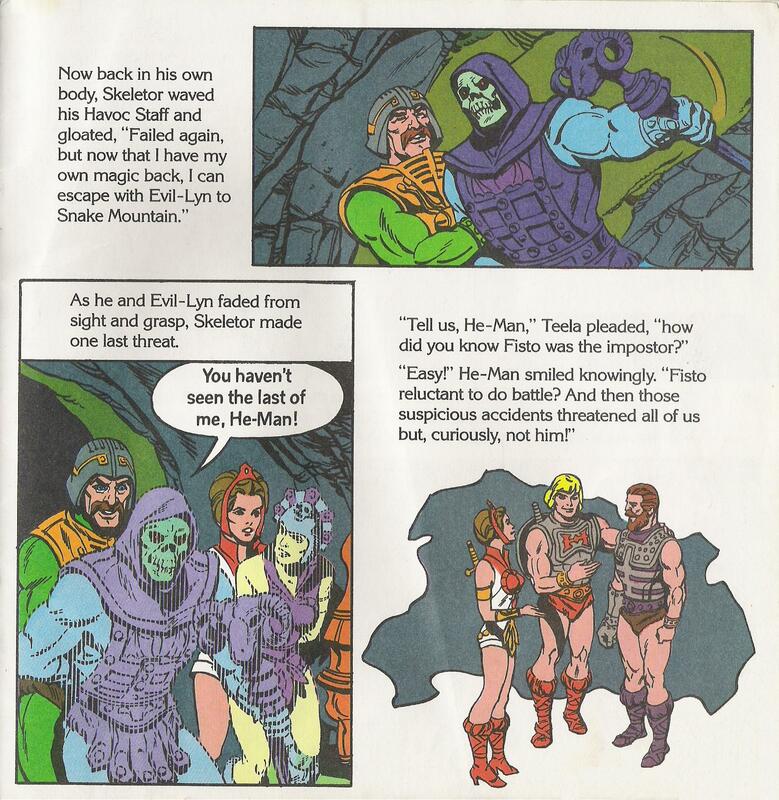 Or even “cheat” and heal some of the damage as the heroes kept retaining theirs. 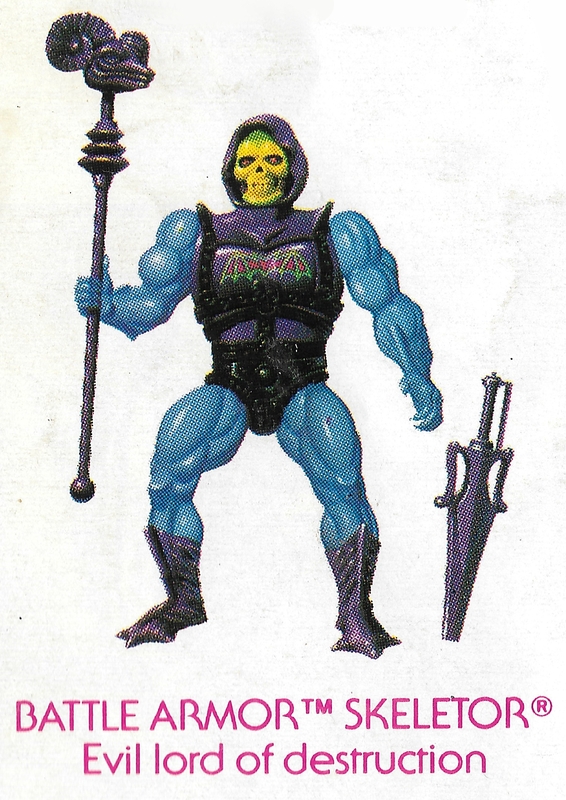 I had thousands of toys but this guy always stayed in rotation..well..I think in 2002 when the new one came out with no special feature but sounds and a VHS, he was finally retired.